The International Space Station is the most complex engineering project ever attempted in space and, at some $150 billion to date, one of the most expensive. The first element of what would become the International Space Station was the NASA-owned, Russian-built Zarya propulsion and storage module, also known as the Functional Cargo Block, or FGB. It was launched Nov. 20, 1998, by a Proton rocket. Two weeks later, a space shuttle carried the first NASA component into orbit, the Unity connecting node, and the two were "mated" to form the core of the station. To understand the engineering challenge facing space station operators, it helps to visualize the 924,000-pound structure as it orbits the Earth 260 miles up, streaking through space at 5 miles - 86 football fields - per second and enduring temperature swings of 500 degrees Fahrenheit as it moves from sunlight to shadow and back again. An Earth-facing port in the Harmony module serves at the attachment point for visiting Japanese HTV cargo ships, SpaceX Dragon capsules and Orbital Sciences Cygnus supply ships. All three are berthed using the station's robot arm. Harmony also features four U.S.-supplies sleep stations, or berths, for NASA sponsored crew members. Harmony's aft port is connected to the U.S. Destiny laboratory module, which in turn is bolted to the central Unity connecting node. The U.S. Quest airlock extends to the right and the Tranquility module extends to the left. A cargo storage compartment is attached to Tranquility's forward port and a set of four gyroscopes, used to re-orient the station and maintain its commanded position, or "attitude," is housed in a short truss that extends from Unity's top port. The Poisk docking compartment extends upward from Zvezda while the Pirs module, which serves as a docking port and an airlock, extends straight down. An aft port is available for manned and unmanned vehicles. The Russians plan to replace Pirs next year with a large laboratory module. Later, they plan to attach a multi-port docking compartment to the new lab and then a solar array assembly that will extend from that module to the right. Mounted at right angles to the long axis of the station is its primary solar power truss, a huge assembly spanning the length of a football field that houses critical electrical components, ammonia coolant loops and steerable radiator panels. The truss is anchored to the long axis of the station by 10 massive struts that connect the central S0 truss segment to the top of the Destiny laboratory. On the front side of the truss, a mobile platform mounted on rails can carry the Canadian robot arm to various work sites. On each end of the truss, four huge sets of solar arrays rotate like giant paddle wheels to track the sun. The arrays generate, on average, some 80 kilowatts of power, enough to supply 55 average homes. Electricity from the solar arrays, known as "primary power," is routed to components in the S0 truss called main bus switching units, or MBSUs. The four MBSUs take that 160-volt primary power and route it to transformers known as DC-to-DC Converter Units, or DDCUs, which lower the voltage to a precisely controlled 124 volts DC. This so-called "secondary power" is then directed to the station's myriad electrical systems using numerous electro-mechanical switches known as remote power controllers. The space station cooling system features two independent ammonia loops - loop A and B - that include large ammonia reservoirs, pumps, cold plates and the plumbing required to route the coolant through the big radiators to dissipate heat. Barring a catastrophic malfunction or damaging impacts from space debris, NASA should be able to keep the International Space Station in operation well into the 2020s. The current official goal is 2024, but NASA managers believe that with a little luck -- and steady funding -- the station can be safely operated through 2028, the 30th anniversary of the first module's launch. While the engineering and management challenges associated with keeping the station operational are daunting, U.S. Program Manager Michael Suffredini says they should be doable, as long as NASA has the resources to build spare parts, pay for cargo launches and provide transportation for U.S. astronauts, either aboard U.S. commercial spacecraft or Russian Soyuz capsules. "We have a space station that is designed in a modular fashion meant for repair," Suffredini told CBS News. "So as long as you have spares for all the things that can break, you can last as long as the structure will let you last. Within reason. "The structure, it turns out, most of it was originally designed for 30 years. So all that margin has made it relatively easy for us to get to 2020. 2028 will be a little bit more challenging. ... We may have to sharpen our pencils to get to 2028." Boeing, NASA's space station prime contractor, completed a detailed engineering analysis in 2013 to verify the U.S. segment of the complex can safely operate through the end of the decade and beyond. "When we get to 2028, the solar arrays are going to be struggling, I'm probably going to have a handful of radiator lines that have been isolated," Suffredini said. "2028 might be possible, but it also might be very challenging because then you're talking about the cost of replacing big things that may be prohibitive. "All our analysis kind of says we think we can get to 2028 and that's the path we're headed on. As we start getting beyond 2028, if it makes sense, and things aren't failing at a rate that makes it difficult for us to keep up, and the country thinks it's the right thing to do, then we can look at going beyond that. "But 2028's kind of where we're drawing our line today based on the original design of the structure." In the wake of Russia's annexation of Crimea, subsequent U.S. sanctions and escalating Cold War-era rhetoric, superpower cooperation on the high frontier continues unabated, but potentially serious cracks have developed in the political underpinnings of the International Space Station program. The space station originally was funded through 2015, but the Obama administration agreed to support operations through 2020 -- now 2024 -- as part of a sweeping revision of U.S. space policy that did away with the Bush administration's Constellation moon program. In its place, NASA was told to develop a new heavy lift rocket for deep space exploration using the Constellation program's Orion crew capsule. The agency also was told to oversee development of commercial manned spacecraft to ferry crews to and from the station. On Sept. 16, 2014, NASA announced that Boeing and SpaceX would share $6.8 billion in contracts to build commercial space taxis to ferry astronauts to and from the space station (see next story). The first operational flights are expected in 2017. Until then, NASA will continue to rely on the Russian Soyuz spacecraft for crew rotation.The cost per seat in the latest contract extension running through 2018 is more than $80 million. The arrangement is profitable for the Russians and critical for NASA. But in the wake of the Ukraine crisis, the health of the superpower partnership has been called into question. Last year, Russia's deputy prime minister for space and defense, Dmitry Rogozin, threatened to re-think continued participation in the space station program beyond the previously agreed on goal of 2020. Rogozin is on the U.S. sanctions list and has made no secret of his disdain for the Obama Administration's response to what he views as a legitimate action in Ukraine. Amidst angry Twitter postings sarcastically suggesting NASA look into using trampolines to launch its astronauts to the space station, Rogozin said Russia would need to carry out a detailed cost-benefit analysis to determine whether operations beyond 2020 were justified. But the Russians ultimately backed off the harsh rhetoric and earlier this year, agreed to operate the station through 2024. But they said they will abandon the project after that to assemble their own space station, built in part with modules that originally were going to be attached to the ISS next year. In the near term, given the contentious political environment, some wonder whether NASA's reliance on the Russians for basic transportation to and from the space station puts the agency's former Cold War rival in the driver's seat, raising the question of whether Russia could simply refuse to launch NASA astronauts at some point and, in effect, take over the lab's operation. Along with flying the only operational crewed spacecraft that can reach the lab complex, the Russians also provide the rocket engines and fuel to periodically boost the station's altitude -- a requirement because of the effects of atmospheric drag -- and to change the lab's trajectory to dodge orbital debris. But NASA provides the four control moment gyros, or CMGs, that allow flight controllers in Houston to adjust the station's orientation without using rocket fuel. In addition, the Russian segment of the station relies on electrical power generated by NASA's solar arrays. The solar panels on the NASA-financed Russian-built Zarya module are partially retracted because of interference with other station components. The only Russian power generation is provided by two smaller arrays on the Zvezda command module. "If we didn't have the CMGs, you would burn so much prop (propellant) holding attitude that you couldn't sustain the vehicle," Suffredini said. "There'd be (uncrewed) Progress (supply ships) launching every month to keep up with all gas you'd need. That's probably an exaggeration, but you certainly couldn't do it with the amount of prop we fly up today. "And the four Progresses that fly, on average, per year have a pretty high prop load. So in that respect, we help each other out. We can't do reboost and phasing burns, and they can't afford to carry all the prop to do attitude control." As for electrical power, it appears doubtful the Russians could operate the station on the electricity generated by Zvezda's arrays. "There's some debate about if they were stand alone whether they could do it or not, but certainly in the configuration we're in today," Suffredini said. "We provide them power and as they grow, we'll provide more power. They've been talking about flying a solar power platform (of their own). Until then, they'll get power from us." Along with the CMGs, "we provide them high-rate communications, which they don't have, and constant communications, which they don't have. They can only get comm over their ground sites. That's something we provide to them. They, of course, provide the infamous access to ISS through their Soyuz. That's the big part they provide." In any case, with NASA and Roscosmos now agreeing to continue operating the station through 2024, the European Space Agency, the Japan Aerospace Exploration Agency and the Canadian Space Agency are expected to stay on board as well, although funding remains a major issue. Politics aside, it's not yet clear how NASA will pay for all the projects on its plate -- the space station, development of a commercial crewed ferry craft and the Orion capsule and its huge booster rocket, known as the Space Launch System, or SLS, that NASA hopes to use for deep space exploration. 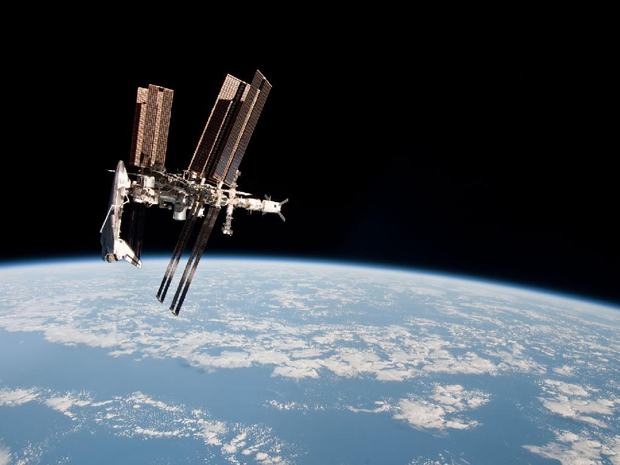 In an era of deep partisan discord in Washington and ongoing battles over reducing the federal deficit, maintaining political support in the United States and among its equally cash-strapped international partners may be the most challenging hurdle facing the space station program. Based on current expectations, "they can't get there from here, and I think a lot of people are pointing that out," said Marcia Smith, editor of Space Policy Online. "But that has not prevented Congress from continuing to ask NASA to do the impossible." John Logsdon, a noted space analyst and aerospace historian, said the issue is "kind of like a smoker's cough -- nobody wants to pay attention to it." "There's clearly not enough money in the long-term outlook to do both a robust (deep space) exploration program and continue to utilize and operate the space station at a $3 billion a year level through 2028 or whatever date the hardware is qualified for." The Russian mission control center near Moscow. Complicating the long-term outlook, he said, Japan and the European Space Agency, "are not enthusiastic about spending money on space station post 2020." "So it's not clear that if there's a decision to go beyond (low-Earth orbit) whether the United States will have its early partners," Logsdon said. "There is certainly a need for a clarification of the global intent for Earth-orbit government-sponsored activity post 2020. And it's a question that is not being very directly addressed anywhere as far as I can see." But to Suffredini, the answer to that question is very clear, if not widely understood. To Suffredini, the value of the space station as a research laboratory and technological test bed far outweighs its relatively minor impact on the federal budget. "People fundamentally do not appreciate what the station is giving back," he said in an earlier interview. "I tell my people all the time, everything else you talk about falls flat. It's about what helps the individual. We need to talk more about what research we've learned to date, what the promises are for the future, what things have direct application." Along with the obvious value of the station's scientific research, Suffredini said extended operations would benefit national security by fostering continued international cooperation; generate the data needed to keep astronauts healthy on long-duration missions beyond low-Earth orbit; and help private industry establish a toe-hold in space. "As a country, the only clear direction we have from Congress and the administration (of a long-term goal in space) is we want to go to Mars," he said. "And what we're finding with the human research we're doing on board ISS, that it will take us beyond 2020 to get all the information we think is necessary to make sure we understand how to mitigate the deleterious effects of microgravity and radiation on the human body." Operating the station beyond 2020 also is critical for encouraging private-sector development of low-Earth orbit. "We are reducing costs, we're going to allow industry to come to low-Earth orbit and figure out what's beneficial and what is not necessarily beneficial," Suffredini said. "We're just in the infancy of sorting that out, and it's going to take to well beyond 2020 for us to figure out what's really going to be useful." The space station doesn't require American-made commercial manned spacecraft -- if would be cheaper over the long run to simply pay the Russians for Soyuz ferry flights, Suffredini said -- but the station provides an obvious destination for commercial spacecraft and a needed customer -- NASA -- during initial development. "As bold as people talk, there's really not an industry yet large enough in terms of customers who are willing to pay the price to go into low-Earth orbit without ISS," Suffredini said. "It's just not there. And the longer it takes us to really get the commercial crew (vehicles), the less viable the industry becomes. "That's another reason we need to keep ISS around, we need to have time for these guys to build a spacecraft (and) operate the spacecraft (long enough) to become safe enough. This, in concert with figuring out what the commercial uses of low-Earth orbit (are), together those two things will help make commercial crew capability viable." In Suffredini's view, one of the most important reasons to keep the station going as long as possible is national security. The space station program requires close cooperation between NASA and Russia, the agency's former Cold War rival, along with the European Space Agency's member nations, Japan and Canada. The shared technical expertise, finely tuned communications and joint management techniques built up over the life of the program will be crucial for future manned flights to Mars, which most observers believe will be beyond the capabilities of any single nation. Operating the space station through at least 2024 will continue to build America's space leadership, Suffredini said. "The part I think people miss the most is what it means to this country to be the leader in human spaceflight," Suffredini said. "And it's not just because we're leading a really big effort, which we are, it's because leadership in space comes with that respect. And partnership in a major effort like that brings national security, and for relative peanuts when you compare us to the cost of defense." As NASA and its partners move into deep space, the partnership "will surely grow. And as it grows, so does our security. That's fundamental. That's an important reason to keep this effort going."